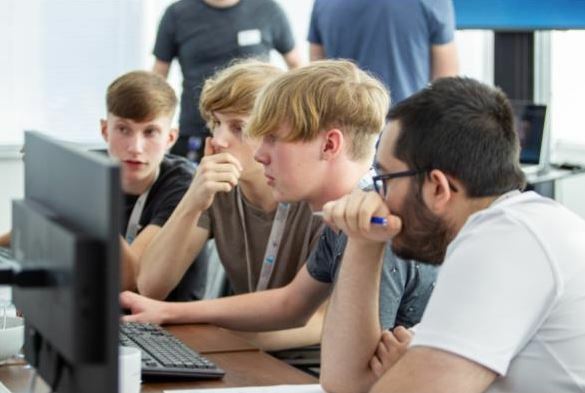 A team of BTEC IT students competed in Lockheed Martin’s cyber security competition in the corporation’s first international CyberQuest. Teams of school and college students visited Lockheed Martin sites across the globe to take part on 20 October. Ben, Taigh, Harry and Jake represented Havant & South Downs College in the competition and visited the site in Whiteley. After a tough day’s competition, team 3n16m4 (ENIGMA) placed fourth with 238 points. Ben said: “The staff are really friendly, Lockheed Martin seems a great place to work.” Taigh said the day was ‘challenging whilst being a lot of fun’. Lockheed Martin developed CyberQuest to challenge and inspire students as part of its focus on science, technology, engineering and maths (STEM). These challenges allowed students to gain valuable skills in stenography, cryptography and examining packet traffic on a network. The challenges are developed by Lockheed Martin information technology professionals, who also assisted students during the event. The event was an inspiration to students to further study Cyber Security and encouraged collaborative working to solve problems.